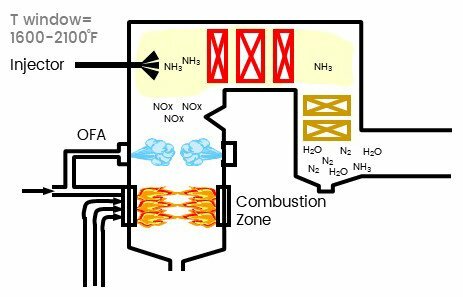 EES through our STEP Combustion group supplies Selective Non-Catalytic Reduction (SNCR) systems that reduce NOx by up to 40% on conventional boilers and up to 80% or more on fluidized bed boilers (C/BFB). 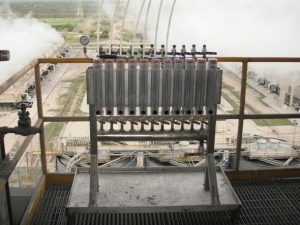 STEP’s propriety high efficiency SNCR system utilizes urea or ammonia reagent which is injected into the post combustion flue gas stream to react with the NOx and form N2 and H2O. STEP’s SNCR systems can use anhydrous ammonia, aqueous ammonia, or aqueous urea. SNCR NOx reduction systems can be applied to coal, biomass, fuel oil and gas fired units. STEP’s SARIS™ system uses a dual fluid design. The design uses air or steam for atomization and droplet size control. For cooling, a small volume of fluid is used thereby eliminating the need for costly and high maintenance retract equipment. STEP’s custom atomizer designs allow precise control of the reagent distribution and droplet size which maximizes coverage and residence time and reduces the number of injectors required (when compared to competitive systems). The dual fluid approach provides precise drop control in customizable spray patterns designed for each particular application. The STEP SARIS injector design is a significant improvement, over competitive technologies. 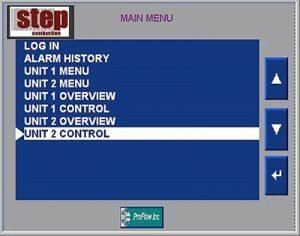 Control options include feed forward or look up table control; alternatively, systems can use feedback control where NOx emissions are used to control ammonia injection rates. The SNCR reaction occurs post-combustion, within a temperature range of approximately 1,600 to 2,100 °F. The optimum temperature within that range is dependent on residence time and carbon monoxide concentration. Lower temperatures require longer residence times. Elevated carbon monoxide levels shift the temperature curve such that better efficiencies are achieved at lower temperatures.